When you get to Ruby Mountain Chiropractic Center come on in, our staff will be expecting you and will help guide you through your visit. If you did not get a chance to download and fill out your health history form we will take a short bit of time to complete this in the office. Communicate as much as possible on this form as it will help the doctor determine direction for your care. We have coffee, tea and water so make yourself at home and do not hesitate to ask if you need help with anything… we’re here to serve you. Please bring along anything you feel the doctor may need to assist you the best. Any pertinent medical information (blood labs, X-Rays, treatment results, etc.) performed at another facility is useful but we can also request this information for you. Bring your health insurance card or information and a form of payment. Co-payments and allowed amounts going to deductibles will be collected for services rendered that day. We also always recommend that a friend or a loved one come along. Someone who knows you well. It’s always good to have another perspective especially if you’re in a lot of pain. Personal Injury: Please bring with you information about your insurance company and the third party (ie. contact info, adjustors name and phone number), your attorney’s information if you have one, policy report or incident report, pictures or any other pertinent information. Workman’s Compensation: Please bring along contact information of your reporting agent (Human Resources, etc.) and any paperwork they have provided as well as any information from other providers seen. Your consultation with the doctor will be your time to discuss your complaints, treatments you’ve tried (if any) and expand on anything else you feel is needed. The doctor will then recommend further testing such as an examination and possibly X-Rays (if needed). The doctor will perform a series of orthopedic and neurological tests as well as take vitals like blood pressure, height and weight. You will usually feel some mild stretching during these tests but you can expect the doctor to stay within your comfort range. These test will help guide the doctor to a conclusion about the cause of your condition. If X-Rays are warranted the doctor will take these of the affected area(s). The X-rays will be take on site with a hospital grade X-Ray machine. X-Rays can tell a lot. The doctor will be looking for any abnormal decay (just like a cavity in a tooth) that may affect how the nerves work. The doctor will also evaluate the structure of your spine and compare its position to normal (just like a normal blood pressure). Other issues will be “ruled in” or “ruled out” as far as a cause of your symptoms. After your examination, if the doctor sees fit, you will be guided to the treatment area. 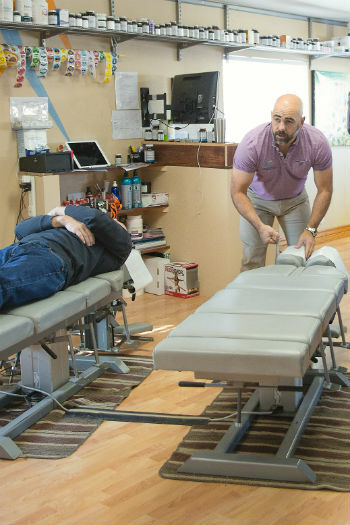 Typically your first treatment may range from a mild adjustment to a physical therapy modality such as electric stimulation or ice and stretching. The doctor will recommend what he/she sees suitable. Your first visit allows us to gather as much information about your condition as possible. After this visit you will be scheduled, at a later date, to review the doctors findings. During the time between your first and second visit you can expect the doctor to completely review the X-rays, exam findings and your health history. Our staff will seek out your insurance benefits to see their level of participation and all of this will be presented to you at your next appointment. You can schedule as early as you want. We’ll be ready for you by the next business day! The doctor will discuss his/her finding with you. You can expect to find out if we have found the cause of your problem, further testing or referral that might be needed, and treatment options. We again recommend that a friend or a loved one come along. Making decisions about your health is important and you want to include those close to you. Please plan on 30 minute for your second visit. The doctor will recommend a treatment plan customized for you based on the findings from the first visit. This may include chiropractic care as well as rehabilitation and other therapies. The details of the recommendations will be covered. Treatment will continue from your last visit. We know that this is an important aspect of getting the care you need. Our goal is to provide accurate information from your insurance company or otherwise and communicate that based on the recommended treatment plan. We recommend paying as services are rendered. We will submit all your service to your insurance company. You can expect to know the total cost of your care before you begin, just like buying an apple at the market. Based on your recommended treatment plan and your decision for care you will be scheduled for future visits. The majority of practice members will schedule a week at a time but please let us know what’s easiest for you. Future visits will consist of treatments focused on your condition. You can expect 30-40 minutes based on your custom treatment plan. Therapies can include adjustments, traction, physical therapy, manual therapy, modalities, traction and more. Interested in learning more? Contact us today to schedule your appointment.